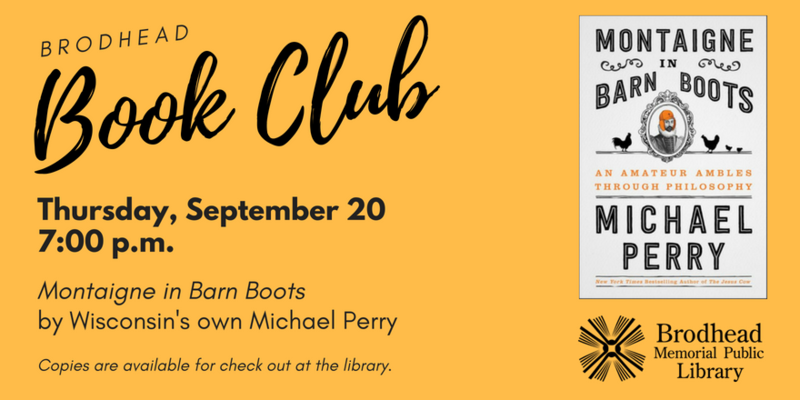 Join us for our September Book Club, where we discuss "Montaigne in Barn Boots" by Wisconsin's own Michael Perry,beloved memoirist and bestselling author of "Population: 485" who reflects on the lessons he’s learned from his unlikely alter ego, French Renaissance philosopher Michel de Montaigne. Books are available for check out at the Circulation Desk. "The journey began on a gurney," writes Michael Perry, describing the debilitating kidney stone that led him to discover the essays of Michel de Montaigne. Reading the philosopher in a manner he equates to chickens pecking at scraps—including those eye-blinking moments when the bird gobbles something too big to swallow—Perry attempts to learn what he can (good and bad) about himself as compared to a long-dead French nobleman who began speaking Latin at the age of two, went to college instead of kindergarten, worked for kings, and once had an audience with the Pope. Perry "matriculated as a barn-booted bumpkin who still marks a second-place finish in the sixth-grade spelling bee as an intellectual pinnacle ...and once said hello to Merle Haggard on a golf cart."